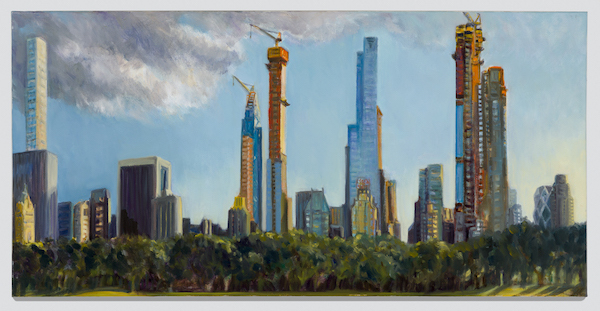 Oil on canvas, 15" x 30"
I am pleased to announce a solo gallery exhibition of my construction sites paintings in New York City, May 2nd - June 8th. Please join me for the opening reception on May 2nd from 6 - 8 pm! The regular hours for the gallery will be Monday through Saturday, 12 - 6 pm with extended hours during Frieze Week. Full information below. For the run of the show, I will be painting on site most afternoons, so let me know when you are coming to visit and I will make sure to be there! I look forward to seeing you, and please share with your friends! 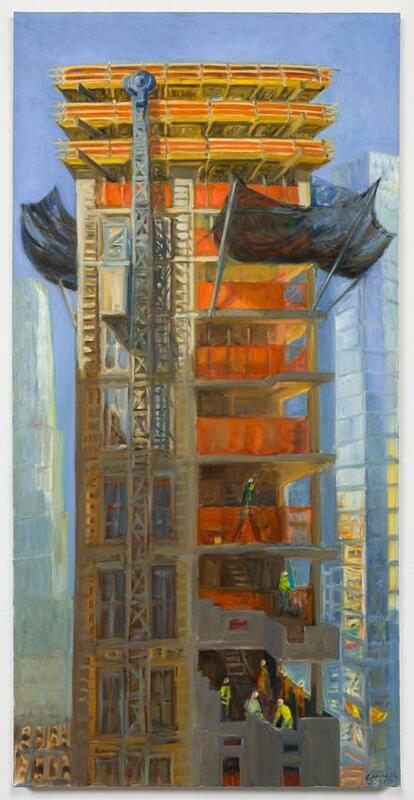 Construction Sites, a solo exhibition of paintings and works on paper by New York City-based artist Gwyneth Leech, explores the incremental yet rapid high-rise building process as the city undergoes extensive physical and demographic changes. This timely exhibition focuses on the visual drama of construction sites across Midtown Manhattan. I am delighted to share a NY1 television interview with Kristen Shaughnessy about my construction site artwork, The Monolith documentary and my current exhibition at the Kaufman arcade. The two and a half minute segment can be viewed online at this link: Kristen S Bush Videos. The 10 minute documentary, The Monolith can be viewed here: www.vimeo/AngeloG/themonolith.com. And information about my current solo show is below. in the Kaufman Arcade Public Art Space at 132 West 36th Street in Manhattan. The exhibition continues through Tuesday, April 3rd. A solo exhibition of paintings by New York City artist Gwyneth Leech bears witness to a rapidly changing Midtown Manhattan. In 2015, construction began in front of Gwyneth Leech’s painting studio window on West 39th street in Midtown Manhattan. The new building would block a city view that had been her inspiration for many years. Overcoming a profound sense of loss and the desire to flee the coming noise and disruption, she made a decision to stay and record the process from the foundation up. She realized then how fast construction sites change, with new shapes, patterns, light effects and human dramas to record daily. Now she sees everywhere a city in a state of dynamic physical transformation and a sense of urgency drives her out to witness and paint as much of it as she can. as well as around the Hudson Yards, by Grand Central Station and on West 53rd Street. Leech has exhibited her drawings, paintings and installations across the United States and the United Kingdom in a wide variety of museum, commercial gallery, public art, non-profit and alternative spaces. She is well known for her artwork on used coffee cups which she exhibited widely as site specific installations, starting in 2011 in the Garment District Alliance Window Space for Public Art on West 38th Street in New York City. Leech holds degrees from the University of Pennsylvania, Philadelphia, PA, and from Edinburgh College of Art, Edinburgh, UK. The recipient of numerous awards and grants, including several Scottish Arts Council awards, a University of Colorado's President's Fund Grant, an Elizabeth Greenshields Memorial Award and a Thouron Fellowship, Leech's artwork resides in important private and public collections. For more infromation about art in the Garment District click here. The Monolith is now live on Vimeo! "The Monolith defies our expectations re: artist profiles with this profound and visually engaging portrait of NYC artist Gwyneth Leech"
The Garment District Alliance is proud to present the 14th Annual Garment District Arts Festival, featuring Gwyneth Leech. The Garment District Arts Festival is a district-wide celebration of the artists, performers, galleries and theaters that contribute to the creative energy that fuels this neighborhood. The Garment District Arts Festival takes place October 19-21. Visit the 2017 Arts Festival Website for the most up to date festival information. A documentary short about Gwyneth Leech's artwork and studio practice will screen on Saturday, October 7th during the East Hampton Film Festival. "I am honored that my current artwork and studio practice are the subject of a documentary short by New York film-maker, Angelo Guglielmo (The Woman Who Wasn't There, 2012; The Heart of Steel, 2008). The short will have a work-in-progress screening next Saturday, October 7th at the East Hampton Library at 1PM during the East Hampton Film Festival. I will be there with Angelo for a Q&A afterwards. If you are out there, please join us!" In April of 2017, artist Gwyneth Leech travelled from New York City to Cotonou, Benin, in West Africa to participate in an artist exchange program. "Art has no walls.. by traveling to Benin, and meeting with local artists.. sharing our art and art making- processes we were able to transcend language, find common ground and discover that our lives and goals were not so different. " I am pleased to be showing new construction site drawings and paintings in the offices of Sciame Construction on Wall Street in Lower Manhattan through December 15th, 2016. The exhibition can be viewed weekdays by appointment by emailing me at gwynethl@earthlink.net. Window Installation for Concepto Gallery, Hudson, NY. I was pleased to create a site-specific window installation for "Art on / with Paper", a group show at Concepto Gallery, 741 Warren Street in Hudson, NY. The exhibition ran from September 19th to October 17th, 2015. Curated by gallery director, Kiyoshi Ike. -Preparatory oil paintings on paper for the stations of the cross commission, 2004 (the finished paintings are permanently on view in the church across from the gallery). from November 6th to December 3rd, 2014. I showed brand new cup and painting pairs based on the idea of the City as Coffee Cups. at Admit to Bitter, a pop-up gallery and shop in the South Street Seaport, at 117 Beekman/Titanic Park, NYC, open 12-7PM daily through the middle of December. I am pleased to announce that my second collection of ceramic coffee cups for Anthropologie is now widely available in their USA and Canadian stores as well as online. Click here to purchase online, international shipping available! It continues to be an adventure filled with unexpected twists and turns. Wishing you all the best for the upcoming season of celebrations. I will be in Grand Rapids for a week, installing 1001 coffee cup artworks, (my largest cup art installation so far! ), then drawing in the window of my venue for five days, September 24-28.
any time between 9/24 and 10/12. September 24 - October 12. I am pleased to share a new video about my working process, from Faber-Castell, whose artist-quality Pitt pens I use when I draw on my coffee cups. It was shot on location last Spring in Hell's Kitchen and in my Garment District art studio. I am delighted that I will be creating my largest cup art installation to date, for the city-wide ArtPrize festival and competition in Grand Rapids, Michigan September 24th - October 12th, 2014. More details coming soon! Gallery Hours: Wednesday-Sunday 1:00-6:00 pm; Closed Mon-Tues.A multi-media exhibition curated by Elisa Decker and Barbara Lubliner featuring 19artists who engage time as a palpable presence. Each artwork tells its own story, bringing attention to the temporal nature of life and inviting contemplation and dialogue about our relationship to time. I will be doing two live drawing events in the gallery on Saturday, May 31, 1:00-4:00 pm and Sunday, June 15, 3:00-6:00 pm. Anthropologie is pleased to announce a special live art event and window exhibition to celebrate the work of fine artist Gwyneth Leech. The artist will be on site November 21st, 22nd and 23rd drawing in the window of our Cambridge location. The exhibition, which will remain on view through November 30th, will showcase her passion for public art and her love of drawing and painting on paper coffee cups. Leech began working in this uncommon way while attending meetings over coffee in 2009. Quickly consumed by the practice, she soon created enough cup artworks to display in public art spaces and galleries around New York City. Her largest installation, at the Sprint Flatiron Prow Artspace in New York City in 2012, featured more than 850 of her pieces. Leech’s most recent exhibition, in Anthropologie’s Regent Street location during the London Design Festival in September 2013, garnered public and critical acclaim, including coverage in Selvedge, The Financial Times, The Observer and The Telegraph. Anthropologie has partnered with Leech to transform her artwork into ceramic versions that can be enjoyed by a larger audience. The eight designs, in limited edition reproductions, are inspired by her life in New York and capture everyday moments, from taking a walk in Central Park to rushing through the city in a rain shower. They will be available just in time for the holidays on Anthropologie’s website and in all store locations. Well, London was amazing! Now I am back in New York City sorting through photos and I will be posting a detailed wrap-up soon on my blog, Gwyneth's Full Brew. In the meantime, many thanks to British film-maker, Chris Floyd, for this delightful short film. It was shot and edited just a few weeks ago while I was actually working in the window of Anthropologie in Regent Street during the London Design Festival. It really captures the moment for me. And the shoot was a lot of fun! the London Design Festival in September with an exhibition of 365 of my original cup artworks in the window of their store at 158 Regent Street. from September 14 -18, drawing on cups! If you happen to be in London then, please come on by and see me at work in the window. The cup art installation will be on view 24 hours a day through October 4th. For those of you in Scotland, I will also be doing a one day event in Edinburgh at Anthropologie's George Street store on Saturday, September 21st from 12 - 3pm with a talk at 2pm. Gwyneth Leech: 365 -A Year in Cups. Fri -Mon 1- 7 pm, through March 23rd. The public joined me to draw on cups, Fri, Sat, and Mon from 10 - 4 pm through 3/23. Tues - Sat 12-6pm, ran through April 13th. 568 Broadway, 502, Tues - Sat 11-6pm, April 5 to May 11, and still open by appointment through the end of May. this exhibition was an official part of the 2013 New Museum's Ideas City Festival. Read the latest posts on my blog: "Gwyneth's Full Brew: art and life in New York City, cup in hand"
I am a painter living in New York City and I draw and paint rather compulsively on paper coffee cups - the ubiquitous take-out kind. In my blog I am documenting the intersection of tea, coffee, art-making, art-seeing and daily life. I blog about family life in the city, exhibitions I go to, artists I meet, things I am working on in the studio, and upcycle, recycle and eco-art. I like my hot coffee or tea in a paper take-out cup, like millions of my fellow citizens. Even better than the contents, I like the used cup as a surface to draw and paint on. And before I begin I inscribe the date, location and occasion on which the beverage was consumed so that every cup becomes the record of a social moment. 655 of the resulting paper cup artworks are now on show, suspended in the main gallery of the Pearl Fincher Museum of Fine Art, as part of their current exhibition, Luxuriant Refuse. The Pearl Fincher Museum of Fine Arts presents the exhibition Luxuriant Refuse curated by Melissa Grobmyer of MKG Art Management. Artists in the exhibition choose detritus as a medium, exploring ideas about consumption, creativity, and transformation. Artists include Adela Andea, Johnston Foster, Allison Foshee, Sarah Frost, Gwyneth Leech, Shawne Major, Aurora Robson, Betsabeé Romero, and Paul Villinski. All are invited to an evening event with MKG Art Management on Tuesday, June 5 from 6:30-8:30pm at the Pearl. where 5th Avenue and Broadway cross at 23rd Street. from September 20, 2011 through February 18th, 2012! with your name and the date you drank the beverage written on the bottom. and I will add it to the installation. Wash out your cup first. 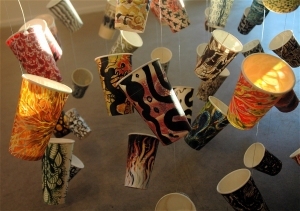 "Gwyneth Leech, The Cup Drawings"
An Installation of drawings on upcycled paper coffee cups. "With Leech's diverse background in painting, video, ceramics, calligraphy and printmaking, the cup series began as a casual outgrowth of her compelling urge to draw wherever she is. One day, without a sketchbook handy, Leech used what was available in the moment. The curved form, challenge of working with existing shapes, colors, and text, and the infinite possibilities of expressive variation became as addictive as the caffeinated beverage the cup once contained. In addition to raising issues of consumerism, post-consumer waste and environmental concerns the cups are essentially about what drawing is: a conversation between mark making and surface." Check out my blog: "Gwyneth's Full Brew: art and life in New York City, cup in hand"
During the Pool Art Fair this coming weekend I will be keeping my studio going by taking to the bed with art materials in Room 940, Gershwin Hotel 7, E. 27th St. NYC. Climb aboard and make drawings of your own family! If I like what you do I might add it to the show. Markers, crayons and paper will be available. to express relationships which transcend the politics of race, religion and gender. and go upstairs to the Great Hall.